Broadsides are single-sheet printed documents. They were frequently displayed or posted in public areas such as in taverns, outside meeting houses, or around municipal buildings. A variety of materials were printed on broadsides including poems, government proclamations, songs, and advertisement. Frequently they contained graphic images and a variety of typefaces and symbols. Although often printed on large pieces of paper, they could be of any size. A broadside may be compared to a poster or a handbill advertisement of today. 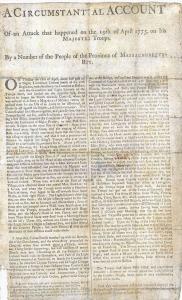 The British version of the events leading to and including the battles of Lexington and Concord is presented in this broadside, A Circumstantial Account of an Attack that Happened on the 19th of April 1775, on his Majesty's Troops. Note the calm tone of the language and the lack of any graphic images. This broadside attempts to down play the significance of the "unfortunate affair" while clearly blaming "a few people" for instigating the violence. This broadside also accuses the Americans of scalping and mangling one British soldier while he was still alive. This broadside was printed in Boston in 1775. This work is number 13869 in Charles Evans' monumental 14 volume American Bibliography published in Chicago and Worcester from 1903 to 1959. On Tuesday the 18th of April, about half past 10 at Night, Lieutenant Colonel Smith of the 10th Regiment, embarked from the Common at Boston, with the Grenadiers and Light Infantry of the Troops there, and landed on the opposite side, from whence he began his march towards Concord, where he was ordered to destroy a Magazine of Military Stores, deposited there for the Use of an Army to be assembled, in Order to act against his Majesty, and his Government. The Colonel called his Officers together, and gave Orders, that the troops should not fire, unless fired upon; and after marching a few Miles, detached six Companies of Light Infantry, under the Command of Major Pitcarin, to take possession of two bridges on the other side of Concord: Soon after they heard many Signal Guns, and the ringing of Alarm Bells repeatedly, which convinced them that the Country was rising to oppose them, and that it was a preconceived scheme to oppose the King's Troops, wherever there should be a favorable Opportunity for it. About 3 o'clock the next morning, the Troops being advanced within two Miles of Lexington, Intelligence was received that about Five Hundred Men in Arms, were [mising], and determined to oppose the King's Troops;* and on Major Pitcarin's galloping up to the Head of the advanced Companies, two officers informed him that a Man advanced from those that were assembled had presented his Musquet [sic] and attempted to shoot them, but the Piece flashed in the Pan: On this the Major gave directions to the troops to move forward, but on no Account to fire, not even to attempt it without orders. When they arrived at the End of the Village, they observed about 200 armed Men, drawn up on a Green, and when the Troops came within a Hundred Yards of them, they began to file off toward some Stone Walls, on their right flank: The Light Infantry observing this, ran after them; the Major instantly called to the Soldiers not to fire, but to surround and disarm them; some of them who had jumped over a Wall, then fired four or five Shot[s] at the Troops, wounded a Man of the 10th Regiment, and the Major's Horse in two Places, and at the same Time several Shots were fired from a Meeting-House on the left: Upon this, without any Order or Regularity, the Light Infantry began a scattered Fire, and killed several of the Country People; but were silenced as soon as the Authority of their Officers could make them. After this, Colonel Smith marched up with the Remainder of the Detachment, and the whole Body proceeded to Concord, where they arrived about 9 o'clock, without any Thing further happening; but vast numbers of armed People were seen assembling on all the Heights: while Colonel Smith with the Grenadiers, and Part of the Light Infantry remained at Concord, to search for Cannon, &cc. there: he detached Captain Parsons with six Light Companies to secure a Bridge at some Distance from Concord, and to proceed thence to certain Houses, where it was supposed there was Cannon, and Ammunition; Captain Parsons in pursuance of these Orders, posted three companies at the Bridge, and on some Heights near it, under the command of Captain Laurie of the 43d Regiment and with the remainder went and destroyed some cannon wheels, powder and ball; the people still continued increasing on the heights, and in about an hour after, a large body of them began to move toward the bridge, the light companies of the 4th and 10th then descended, and joined Captain Laurie, the people continued to advance in great numbers and fired upon the King's troops, killed three men, wounded four officers, one Sergeant, and four private men, upon which (after returning the fire) Captain Laurie and his officers thought it prudent to retreat toward the main body at Concord and were soon joined by two companies of grenadiers. When Captain Parsons returned with the three companies over the bridge, they observed three solders on the ground, one of them scalped, his head much mangled and his ears cut off, though not quite dead, a sight which struck the soldiers with horror. Captain Parsons marched on and joined the main body, who were only waiting for his coming up, to march back to Boston. Colonel Smith had executed his orders without opposition, by destroying all the military stores he could find. Both the Colonel and Major Pitcarin having taken all possible pains to convince the inhabitants that no injury was intended them and that if they opened their doors when required to search for the said stores, not the slightest mischief should be done, neither had any of the people the least occasion to complain, but they were sulky and one of them even struck Major Pitcarin. Except upon Captain Laurie at the bridge, no hostilities happened from the affair at Lexington until the troops began their march back. As soon as the troops had got out of the town of Concord, they received a heavy fire on all sides, from walls, fences, houses, trees, barns, &c, which continued without intermission till they met the first brigade with two field pieces near Lexington ordered out under the command of Lord Percy to support them (advice having been received about 7 o'clock next morning that signals had been made and expresses gone out to alarm the country and that the people were rising to attack the troops under Colonel Smith). Upon the firing of the field pieces, the people's fire was for a while silenced, but as they still continued to increase greatly in numbers, they fired again as before from all places where they could find cover upon the whole body and continued doing so for the space of fifteen miles. Notwithstanding their numbers, they did not attack openly during the whole day, but kept under cover on all occasions. The troops were very much fatigued, the greater part of them having been kept under arms all night and made a march of upwards of forty miles before they arrived at Charlestown, from whence they were ferryed over to Boston. The troops had above Fifty killed, and many more wounded: Reports are various about the Loss sustained by the Country People, some make it very considerable, others not so much. Thus this unfortunate Affair has happened through the Ruthless and Imprudence of a few people who began Firing on the Troops at Lexington. Dimensions: 51 x 39 cm.